If you haven’t figured it out by now, classyvegans, I was in Seattle last weekend. Seattle is a beautiful city where the streets are hilly, the public transportation is clean, and there is a vibrant vegan food scene. 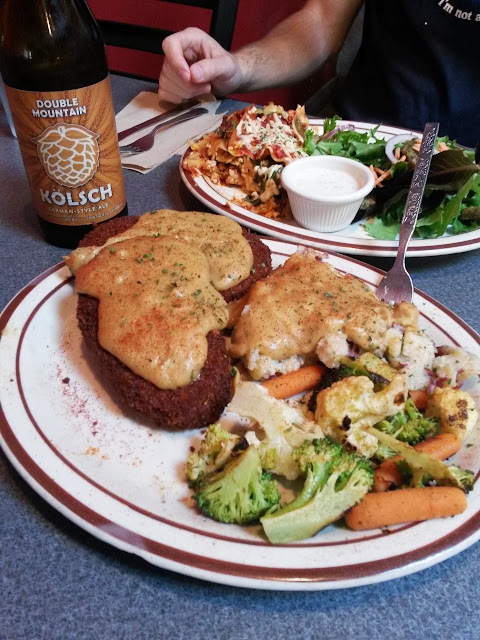 One restaurant I visited in Seattle that really stuck out: Wayward Vegan Cafe. I wanted to tell you folks all about it while it’s still fresh in my mind. As I mentioned in the post about Vegan Haven, there is a vegan-centric intersection up in the University District that is where Wayward Vegan Cafe is located. Right after we got off the plane and checked into our hotel on Friday, we boarded a bus and made a beeline for this place. You order at the counter at wayward and sit down with your drinks, your utensils and napkins, and a number. The service is fast and there are some really lovely paintings on the wall. It’s a bit punk rock, a bit DIY, and all kinds of wonderful. Having not eaten since breakfast, we were attracted to what were surely the most fattening delicious things on the menu. I ordered the Country Fried Steak and Tom had the Lasagna. We also had to have some beer, because… beer. Lunch at Cyber Dogs in Seattle. I’m still in Seattle for PAX Prime, so I don’t have a lot of time/energy for a proper post. However! I have been throughly enjoying the vegan cuisine that The Emerald City has to offer. I swear to god I’ve gained 5 pounds since Friday. 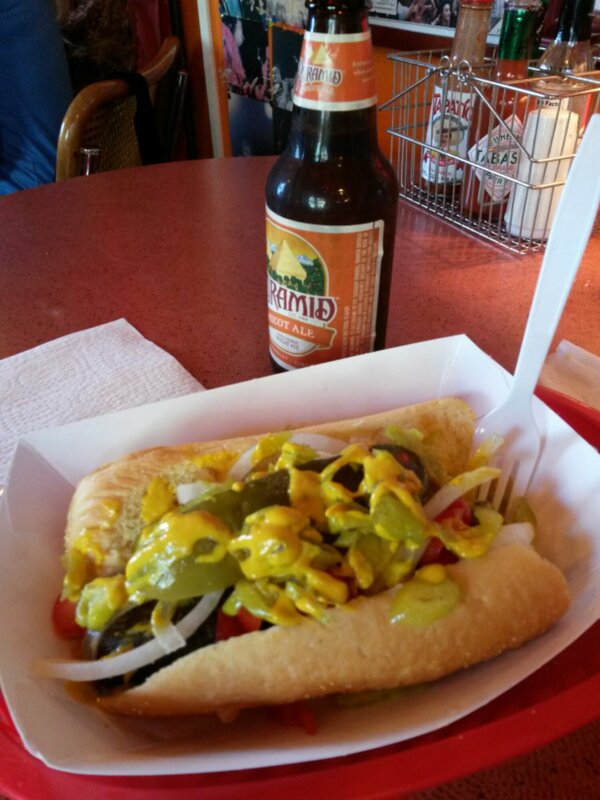 Cyber Dogs, just across the street from the convention center where PAX is held, is an all vegetarian hot dog joint. 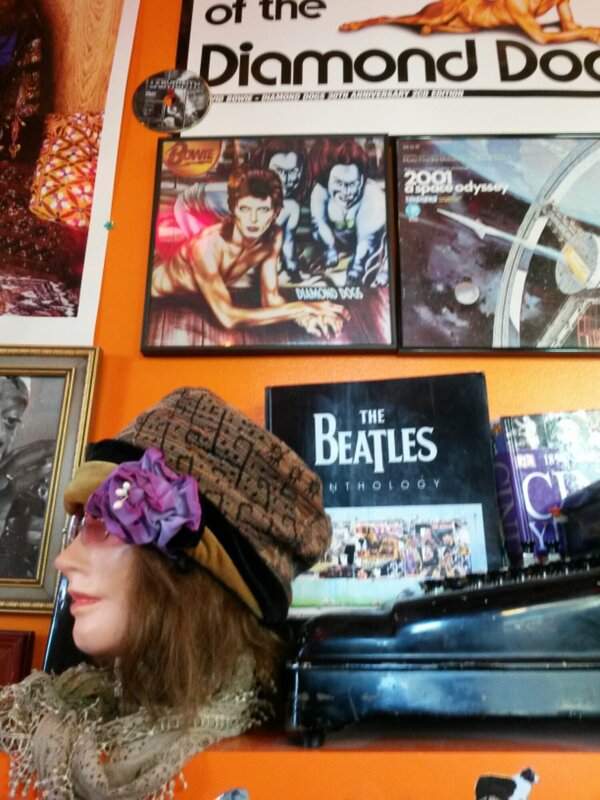 All their menu items can be made vegan, and the walls are covered in awesome, kischy decor… like old David Bowie album covers and well-appointed mannequin heads. I had the Chicago dog, a toothsome, well-seasoned vegan link with raw onions, pickled peppers, tomato slices, a whole pickle wedge, celery salt, and mustard served on a hoagie roll. I attempted to take one bite of it and realized I would need a fork to pick up all the morsels that would escape the bun. I lived in Chicago for a couple years, and never managed to have a “real” Chicago style hot dog, so I can’t offer any opinion’s on the Cyber Dogs version’s authenticity. Nonetheless, it was a satisfying convention-goer lunch. Stay tuned! I have a couple more special MoFo Features in the works and I’ll tell you all about those in the coming days. It’s going to be a great month! After a 31-month hiatus from blogging I signed up for Vegan MoFo. Which was clearly the not crazy-difficult decision. For those of you who are unfamiliar with the concept, it’s short for the Vegan Month of Food. A bunch of vegan bloggers, food bloggers, and other kinds of bloggers band together and commit to posting every day (or nearly every day) in September about vegan food. No non-vegan posts allowed! Not even posts including honey. Which, thankfully, is not a problem for me! So remember how I said that the blog would be a Monday-Wednesday-Friday affair? Well, that idea will be suspended for the month of September while I attempt to post every day! I guess it’ll be like doing a YouTube VEDA or participating in NaNoWriMo. I’m going to be honest. This will be a challenge for me. Being witty and interesting while trying to come up with delicious-looking photographs takes a lot of energy. But as I am currently otherwise unemployed, I can make classyvegan.com my full time job. At the very least, it’ll be better for me professionally and personally than sitting around watching the Price is Right all morning (though I do loves me some Drew Carey). In an interesting twist, I will be in Seattle attending PAX Prime from August 30th to September 2nd. So the first two Vegan MoFo 2013 posts will be coming from my phone. You’ve got to love technology. I am pretty thrilled to try all the vegan places in Seattle, though. Especially Wayward Vegan Cafe. I took a peek at their menu and I want to try SO many things on it that I may have to visit there more than once during my 4-day trip. Look for a preview of everything I have planned for a September full of Vegan delicacies on Friday, August 30th. If you’re interested in other bloggers who are participating in Vegan MoFo, you can check out The Vegan MoFo website. I think they’ll post the full list of bloggers doing Vegan MoFo soon. If you want to sign up, too, there is still time! The deadline is tomorrow, August, 28th.